I don't really have any great photos of this year's Halloween endeavors, but at least I was able to capture my creations with my camera phone and my friend's far superior iPhone camera. First up is my cubicle costume. 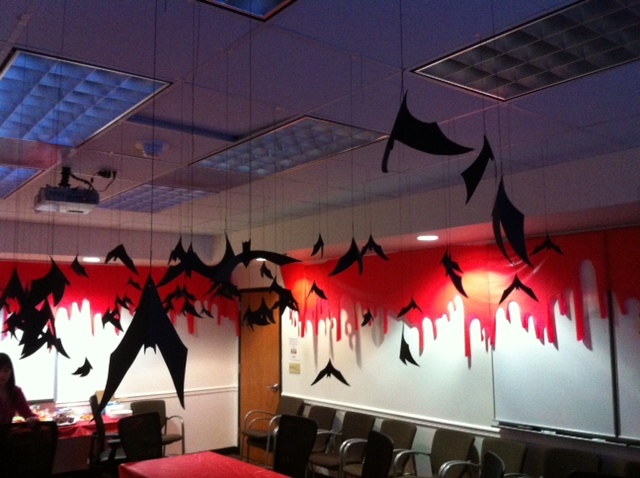 In my office, we dress our workspaces up for Halloween. While my much cleverer colleagues dressed their cubicles up as timely, topical puns and plays on political goings-on, my cubicle was neither topical nor nuanced but I would argue well-executed. Remind you of anything? 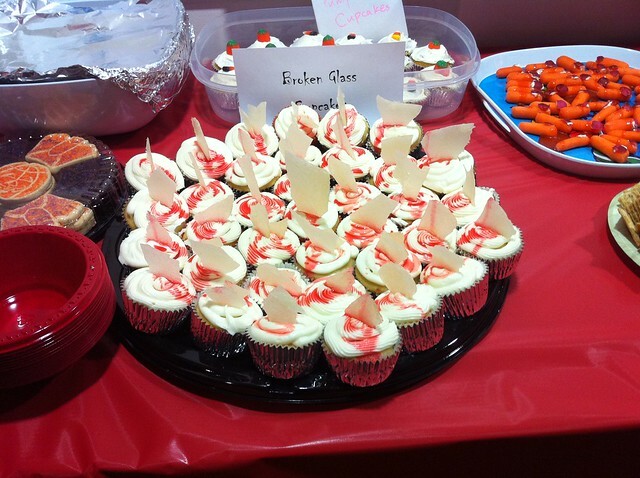 For the office-wide party, my friend Jillian and I tried our hands at Martha Stewart's Broken Glass Cupcakes. We almost got it right, but if you try to make the glass too far ahead of time, it apparently clouds. Oh, well. And finally, my pièce de résistance was the decor for the office-wide lunch party. I've volunteered to decorate this conference room on more than one occasion, and I've got to say that no matter how much effort I put in, the conference room is so big and blah and fluorescent that it seems to overwhelm even my best efforts. But this time, I think I got it right. A gaggle of bats? Check. Bleeding walls? Check. I even had Night of the Living Dead silently playing on the two 60" teleconferencing monitors on the opposite wall. And the best part of these decorations was how ridiculously cheap they were. I picked up a 100 foot roll of red vinyl tablecloth from Michael's for less than $8 with a coupon. 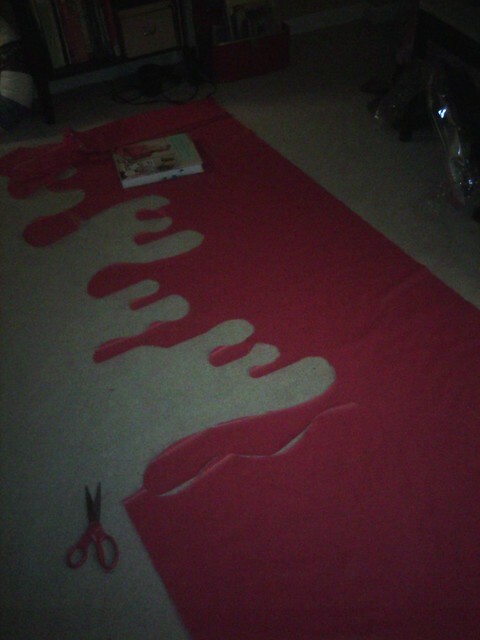 Then, I simply cut into a nice drippy pattern. It was enough to get about halfway around the room and cover all the tables. Not bad. And there you have it...my badly-photographed Halloween endeavors. Did you do anything fun? Any good costumes or decor? It all looks super good! I love the tablecloth deal. 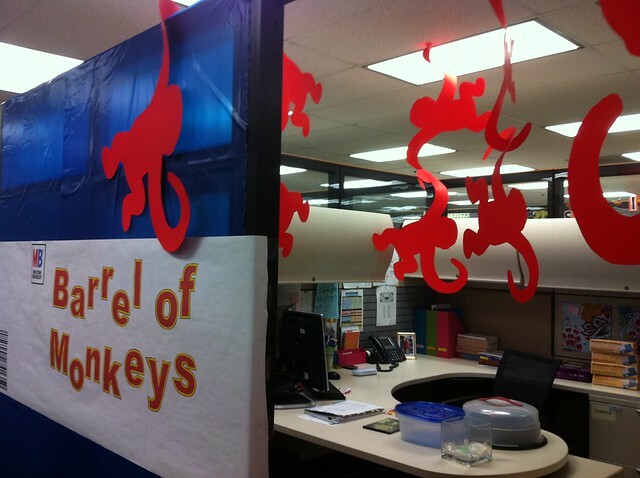 The Barrel of Monkeys is super creative and very well done--looks like you spent hours on it.